Daytona State College is excited to share a new scholarship opportunity for high schools students. Starting this fall, the college will award five Presidential Excellence Scholarships totaling $10,000 each to qualified 2019 high school graduates. Application deadline: April 30, 2019. Successfully complete 100% of courses attempted at DSC and maintain at least a 3.2 GPA per semester to continue receiving the award. To be considered for the Presidential Excellence Scholarship, 2019 high school graduates should download and complete the application form, submit with official high school transcript, two letters of recommendation and essay by Tuesday, April 30, 2019. Candidates may be invited to an interview with the Scholarship Committee in early May. Successful applicants will be notified by May 15, 2019. Recipients must accept the scholarship and register for classes by June 1, 2019 or the scholarship will be forfeited. Earning an associate degree at DSC opens new opportunities for students continuing their pathway to a bachelor’s degree. In addition to saving thousands on the first two years of their four-year degree, Daytona State associate degree graduates can easily transfer into bachelor’s programs at any Florida public university. Through the DirectConnect to UCF partnership, DSC and UCF guide students from their freshman year at DSC through their senior year at UCF to ensure they stay on track toward success. DSC students who graduate from our Quanta-Honors College can qualify for transfer scholarships to UCF or Eckerd College. Or, they can choose Stetson University and receive a special financial package that covers all tuition and fees. For additional information about the Presidential Excellence Scholarship, visit DaytonaState.edu/Scholarships, call (386) 506-3642 or email Admissions@DaytonaState.edu. 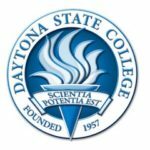 Offering more than 100 certificate, associate and bachelor’s degree programs, Daytona State College has responded to the education and workforce training needs of Volusia and Flagler counties and beyond for more than 60 years. The college enrolls nearly 28,000 students a year at its seven instructional sites, with graduates serving in critical fields including health care, emergency services, business, education, hospitality, engineering, technology and more. Daytona State has been recognized as a leader in higher education numerous times, consistently by U.S. News & World Report, which ranks the college among the Top Tier Best Online Bachelor’s Programs seven years running. The U.S. Department of Education’s College Affordability and Transparency Center has ranked DSC among the top 50 most affordable public four-year institutions in the country, with less than half the tuition of the national average. Community College Week, a leading publication in higher education, annually continues to feature the college in its list of Top 100 Associate Degree Producers. And for three years in a row, U.S. News & World Report has ranked DSC among its Top Online Bachelor’s Programs for Veterans.